Dental sealants are a quick, easy, and relatively inexpensive solution for preventing cavities. They are plastic coatings that are usually placed on the chewing (occlusal) surface of the permanent back teeth — the molars and premolars — to help protect them from decay. Children get a lot of sugar from simple carbohydrates in their diet, which leads to decay. Although the idea behind sealants is not new, they’re quickly becoming the go-to treatment for kids who need extra help in the dental department. If you have a child and are interested in dental sealants, schedule an appointment today. Children notoriously ignore the problem areas in the back of the mouth that lead to cavities and decay, making them the prime target market for sealants. The American Dental Association recommends that kids receive dental sealants as soon as their adult teeth erupt. Those who are more susceptible to cavities and decay. 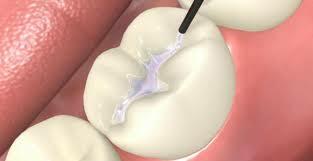 Dental sealants have been shown to reduce the risk of cavities in the teeth that are covered. According to the American Dental Association, decades of research demonstrate that coating the biting surface of molars with a sealant can reduce cavities by up to nearly 80%.